Museum argues that suit to recover ancient art (called the Lydian Antiquities by Turkey and the East Greek Treasure by the Metropolitan) is time-barred under the three-year statute of limitations that has been the custom in New York State. The Museum acquired the objects in 1974. Introducing a new column to focus on stolen and forged art and related issues, such as liability of experts. “Repose” is the first of these columns. When statutes of limitations prevent successful claims of ownership by third parties. Detective Thomas Moscardini recovers six paintings and several rare books hijacked on way to Sotheby's; Frank Lastorino and Peter Rizzo arrested. 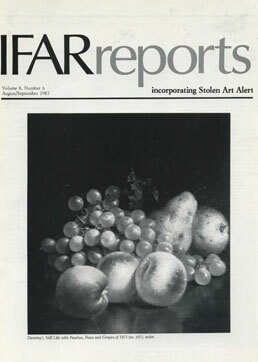 ADAA’s Art Theft Archive to be incorporated in IFARreports. — Elizabeth Hayt-Atkins succeeds Lynn Stowell Pearson. Houshang Mahboubian is free on bail on conviction for attempted theft of his own antiquities. Brueghel, van Dyck, Hals, Holbein, and Lievens stolen from Castle Museum in Gotha, East Germany, in 1980; three paintings, by de Alvarez, Belle, and Tadema, from truck hijacked en route to Sotheby's from Kennedy Airport in 1983. Paintings, Pastels, Mixed Media Works, Watercolors: Buffet, Delacroix, Nerensz, Palmorili y Gonzalez, Rico y Ortega, Sanchez Perrier, Villegas y Cordero, Wieschebrink. Denver, Colorado: Station wagon stolen carrying uninsured art works, including Balink, Redbird, Anderson, Blue Eagle, Willard, Podry, and Black Owl. Geneva, Switzerland: Works by Alphonse Stengelin and other artists missing from Stengelin's barn.